Complement your bed with the perfect bedroom storage case piece! Our Amish made Solid Wood 6 Drawer Dresser with Optional Mirror has six dovetailed drawers with full extension side mount drawer slides for your convenience when you're opening and closing the drawers. 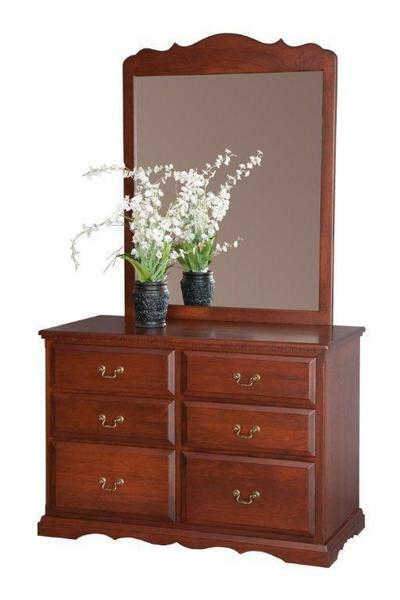 Enjoy premium Amish craftsmanship with our solid wood dresser. The entire dresser is hand sanded and finished in the finish color of your choice that you can enjoy for the rest of your life. Our Amish woodworkers use a special varnish to protect your new Amish dresser from wear and tear. If anything is unclear, please give one of our Amish Furniture Professionals a call at our toll free number - 866-272-6773. Thank you for choosing DutchCrafters.